Speaking at TEDxSalford, Lucy Hawking, best-selling author and influential populariser of science, talks about the importance of using adventurous stories that explain science, and creating engagement through dramatic story-telling. Lucy describes how these ideas came about during a moment when a child asked her father – astrophysicist Stephen Hawking – what would happen if he was sucked into a black hole. Lucy had three revelations: first, that children are fascinated by this subject matter; second, adults can give answers to complex questions that children can relate to; and third, children ask questions that can be turned into engaging stories. With this in mind, Lucy suggests that to get children excited by science we need to create an emotional connection between them and the subject. This is especially important, she argues, because there are major challenges facing the world, which can be tackled better if everyone was included in the debate. However, people need to be scientifically literate to achieve this. Although the use of storytelling to explain the natural world around us is not a new idea, Lucy couldn’t find this technique being used to teach science. It became her mission to fill this void. For more information, or to book Lucy Hawking as a speaker for your conference or event, please contact Alex Hickman at alex@chartwellspeakers.com or call 0044 (0) 20 7792 8004. The best explorers challenge the norm, push the boundaries of what is possible, and motivate others through their inspirational stories. They are shining examples of how to overcome physical and mental barriers with great fortitude to achieve the seemingly unachievable. Using award-winning photographs and video, these modern storytellers share adventures from the field. Reporting on a wide range of human-interest and conservation topics, their keynotes offer relevant leadership lessons and management insights for the business community. Here are six memorable speakers who translate lessons learned in the great outdoors into new rules and behaviours for the office and boardroom. Tell us about your upcoming event, and we’ll provide a shortlist of adventure speakers for you. Ann Daniels: First woman in history to reach the North and South Poles as part of an all women team, who motivates women to achieve in the workplace. Rob Lilwall: Hong Kong-based TV adventurer for National Geographic, famed for his three-year 30,000 mile “Cycling Home From Siberia” expedition. Leon McCarron: Specialist of long distance, human powered expeditions, film-maker and best-selling author of “The Road Headed West” (2014). Paul Niel : Social entrepreneur, active angel investor, futurist and adventurer who has summited the highest mountain on every continent. Charlie Walker: Award-winning travel writer who shares lessons learnt from his inspirational 43,000 mile cycle through Europe, Africa and Asia. Levison Wood: Former Officer in the British Parachute Regiment, journalist and explorer who undertook a world-first expedition to walk the length of the River Nile. 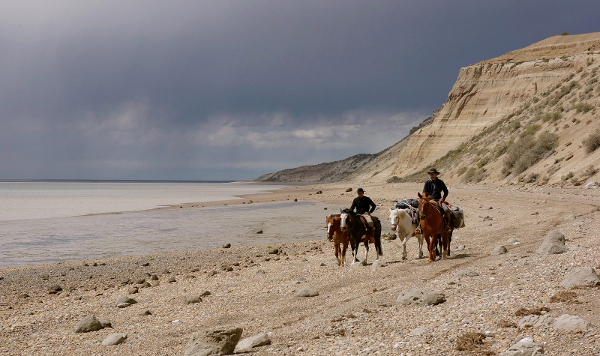 Leon McCarron, adventurer, film-maker and best-selling author of “The Road Headed West” (2014), has written an article for Sidetracked magazine – “The Last Explorers on the Santa Cruz” – detailing his horseback journey through Patagonia. Click here to read the full article, and for stunning photographs of the expedition. For more information, or to book Leon McCarron as a keynote speaker for your conference or event, please contact Leo von Bülow-Quirk at leo@chartwellspeakers.com or call 0044 (0) 20 7792 8000. Four years ago today motivational speaker Mark Pollock, a blind endurance athlete, fell from a second story window. He lay in hospital for nearly 16 months – paralysed, blind and psychologically fragile. But, what a difference 4 years makes… Have a look at this short video (above). Here at The Mark Pollock Trust we have evolved from supporting Mark in his time of need to seeking ways to fast-track a cure for paralysis that will benefit him and the millions of paralysed people around the world. Spurred on by the support that you bring through donations and entering the Life Style Sports Run in the Dark, Mark and the Trust thank you from the bottom of our hearts. This year’s Life Style Sports Run in the Dark is happening on 12th November and with plans well under-way to make it bigger and better we can continue to explore our mission in the Trust. Early bird is open until 31st August. To find out more about Mark Pollock, or to book him as a speaker, please contact Leo von Bülow-Quirk on 0044 (0) 20 7792 8000 or at leovbq@chartwellpartners.co.uk.